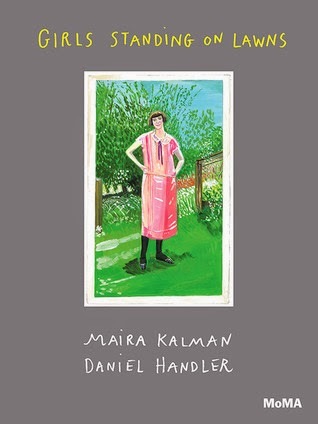 In this most recent collaboration between Daniel Handler and Maira Kalman, they also partner with the Museum of Modern Art. Taking their inspiration from anonymous old photos of girls standing on lawns (as the title suggests), Kalman interprets some of them through vibrant illustrations - others appear in their original form - while Handler supplies pithy prose. There's not a story so much as a meandering path through the unknown lives of these lawn-standing girls. This is more about style than substance, but I enjoyed this short diversion - and it is short, under 60 pages, with only a few words scattered here and there. Though stylistically different from anything else he's written, Daniel Handler's voice was still recognizable even in these short snippets, which captured the sorts of things we think when looking at old photographs. "We are all gone from here. And yet we are still standing." As always, Maira Kalman's illustrations are vibrant, inviting, and quirky. If you're not familiar with her, I urge you to look at her beautiful photo essays here. They are visually delightful and, often, quietly patriotic. Girls Standing on Lawns is essentially a picture book for adults, which, why isn't that a thing? Fortunately, this is first in a series from MoMA, Handler, and Kalman and I am looking forward to what lies ahead. I hope others take inspiration and make this a genre because I could certainly do with some more age-appropriate picture books in my life.